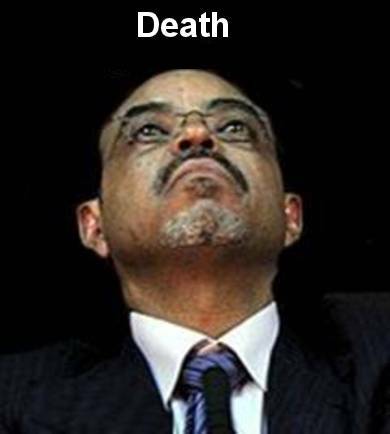 July 18, 2012 — Ethiopian strongman Meles Zenawi may not survive his battle with an unspecified illness that's thought to be blood cancer, according to western diplomatic sources who spoke to the Telegraph news agency. The 57-year-old dictator is being treated in a Brussels hospital as a private patient and is listed as being in 'critical' condition by European officials who asked not to be named. "He is being treated as a private person and the information is confidential but it is understood that he is critically ill," a diplomat informed the London-based news agency. The ailing premier is thought to suffer from a number of illnesses including blood cancer, brain tumor and type 2 diabetes. After weeks of denial, the Ethiopian government admitted Meles was being hospitalized on Monday but denied he was in critical condition. A scheduled news conference by the government to clear up his health status to the media Wednesday afternoon was postponed without explanation, leaving many citizens to wonder if the regime is buying time for a successor.